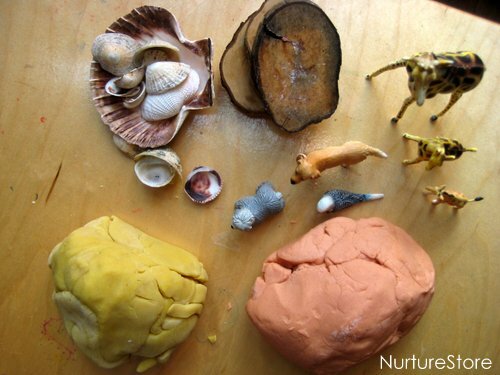 We’ve been chatting over on NurtureStore’s Facebook page recently about free play with loose parts. I know many of you are working to include more and more bits-and-bobs and open-ended resources in your play spaces, and switching from plastic and commercial toys to more natural materials. So today I’m talking about why I love to encourage lots of free play in our home, and I have a super, printable list of loose parts you might like to try out. 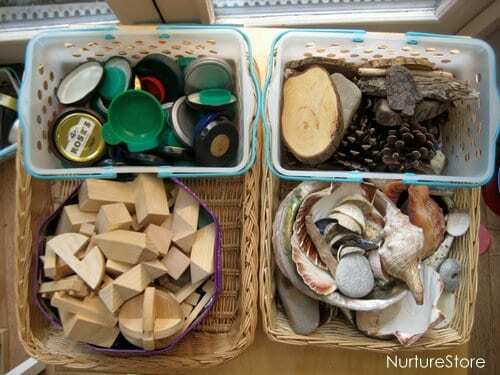 Loose parts simply means moveable materials that children can use in their play. They might be bought materials, upcycled from the recycling bin or found natural objects. 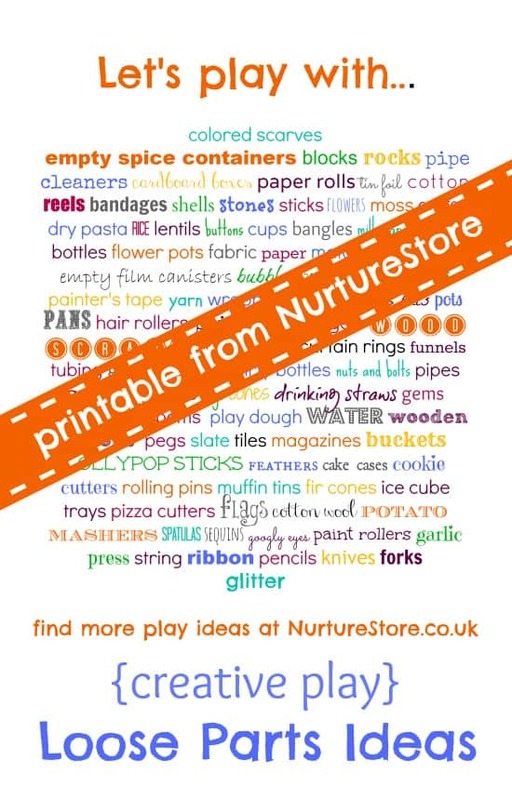 There’s a printable list of some loose parts ideas below, but really anything goes: boxes, feathers, marbles, wrapping paper, fir cones, water, sand, twigs, hats, drinking straws…..
We’re not only talking about creative play from an artistic point of view – although loose parts do provide great materials to sculpt and build – but creative play that encourages brain development, scientific experimenting, mathematical thought, risk taking, and trial and error learning. Through this kind of free play children are really creating: using what they have and what they already know, and combining that to create a whole that’s greater than the parts. Just like Einstein, Da Vinci and Jobs. 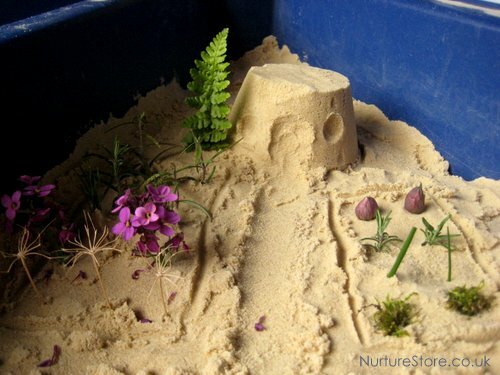 Loose parts and free play in childhood develops the creative genius of the future. 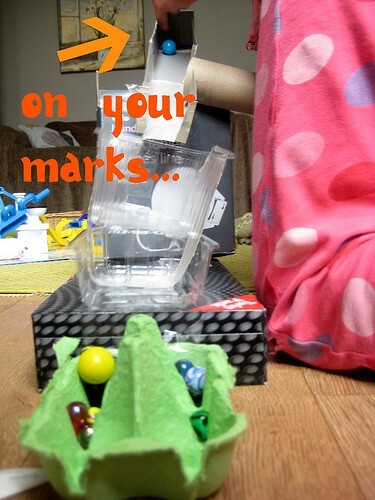 You can see this in practice in the marble run B built a while ago. I’d introduced a new resource for the children to explore that week : the marbles. On offer as always on the craft shelves was a variety of loose parts. To make her marble run B had to imagine her end product and carefully select the right materials that allowed her to build what she’d intended. Things didn’t always go to plan – things broke or the marble didn’t move along the right chute – so she had to analyse, problem solve and persevere until she’d managed what she set out to achieve. This kind of hands-on learning is what we encourage and it helps children hone really important thinking skills that will help them throughout their lives. The great things about stocking your play space with loose parts is that anything goes (so long as the materials are suitable for your children’s ages and stages) and they’re mainly free. Natural materials, recycled items and donations from friends, families, and local businesses are all great places to get your materials. You don’t need to think about how the children might use the materials – leave that to the kids. Provide the loose parts, step back and let the children play. They might surprise you with their imaginations and create things you would never have dreamed up! 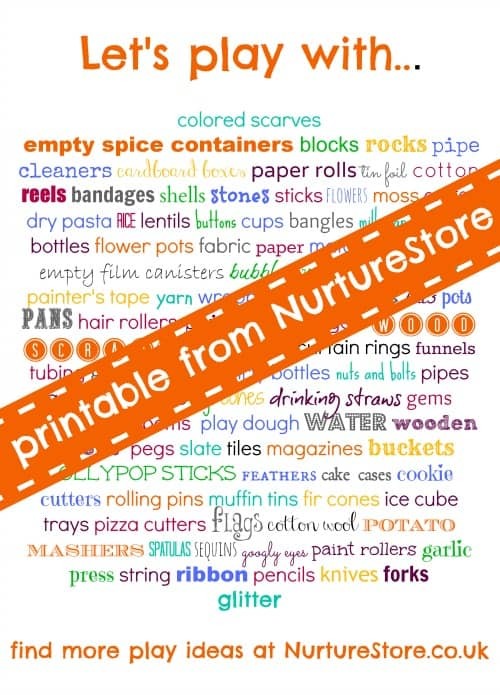 We’ve been chatting over on NurtureStore’s Facebook page about what kinds of loose parts to offer and we’ve come up with some suggestions. Print a copy of this poster below, to keep handy for when you need a few ideas. Let’s be clear: these are just ideas. You don’t need to provide all of these! Offer what you already have and use this for suggestions of extras to add in over time. I like to use a Magic Three formula when we need an injection of ‘new’. Simply pick three items from this list and set them out as an invitation to play. Remember you don’t need to think the three materials match or work well together. The idea is to offer something different, perhaps unusual, to spark the children’s thinking. Yarn, curtain rings and play dough…. Who knows what the children will come up with using the Magic Three! Hi! You have given me lots of inspiration with this post for my classroom for next year. Thanks! This is a great idea..
What a lovely and informative post! 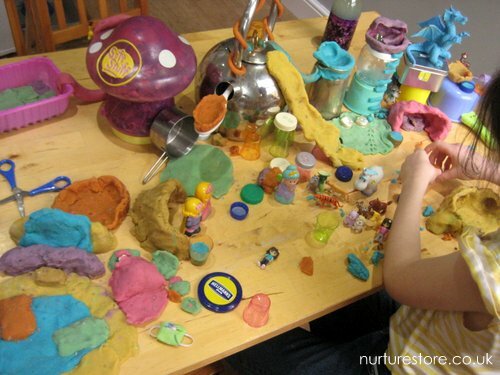 I adore loose parts play- that’s pretty much what we do at our house on any given day. I’ll start sharing our play ideas using your hashtag! Yay for like-minded loose parts enthusiasts! Yes the light tables look great – have you got one Faigie? Light boxes are easy to make. All you need is a transparent box, parchment paper and LED lights from the dollar store. Cover the inside bottom of the box with the parchment paper, turn on the light source and turn the box upside down over the light. There you have it – an easy but fun light box for the children to play on. Great idea Lisa. Exploring the loose parts on a light box adds a really interesting extra element. I love this concept and have been trying to apply it, but am having trouble with the “clean up” phase. Any suggestions for how to keep these loose parts materials organized but still accessible? Do you have rules for your children as to how and when they must put these items away? I want to let “free play” be as FREE as possible and not impose rules but then I find I am face with cleaning up a huge mess at the end of the day. What to do? I have recycled loose parts in the art area. Many of the children collect the pieces in a bag and/or box to take home. Do you have any suggestions as to how to guide the children into art ideas and just collection treasures?